Minnecojou Lakota poet Trevino Brings Plenty discusses two poems from his volume Ghost River, as well as Native culture, writing, and the protests at Standing Rock. You can buy Wakpa Wanagi, Ghost River, on Amazon or order it through your local bookstore. Music by Rise and Shine (2015), Seastock from Jamendo.com. 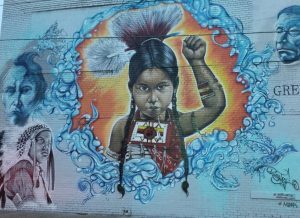 Artwork from a mural in Detroit.